Agitated, sweaty and perpetually late subway riders have had enough of New York’s disintegrating transit system and plan to protest outside of Gov. Andrew Cuomo’s city office tonight to give him a piece of their mind. Will he fix the trains after this? Probably not, but it’s something. The subway system continues to be falling apart, just when you think it can’t get any worse. A man kicked the window of the door open. We began calmly single file exiting to the last train. If the fire came any closer the idea was to evacuate and go down the tunnel out the last train. I helped one person, then another climb through the window, holding purses, lending an arm. A shorter women came and a man and I lifted through the window he followed her to help her through the next. I followed shortly after, I wasn’t one of those real brave people who put everyone before themselves. When I got to the last car the air was better but I started shaking slightly, thinking about how long we’d already been in the dark. 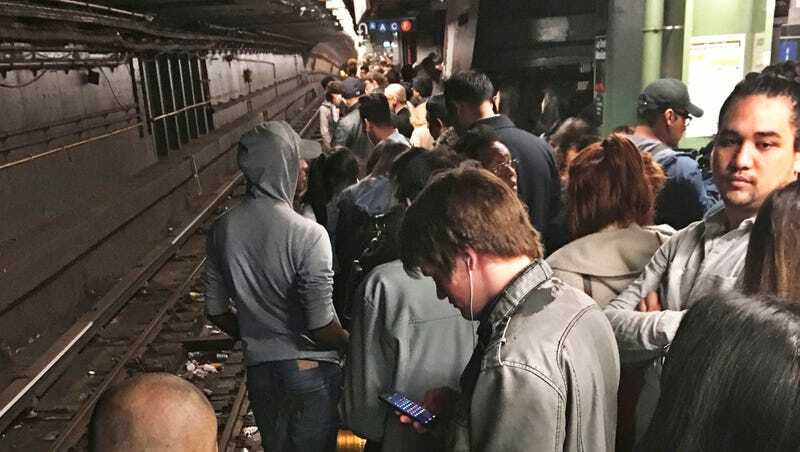 The evacuation is just one of many horror stories about the subway slowly falling apart, leading to MTA announcements of delays and closures on virtually every line. We’re seeing the subway’s total collapse now after years of under investment, using an outdated signalling system and rapidly growing ridership. Why is the subway bad? Lots of reasons. It’s 113 years old, runs on an signaling system that dates back a century (!!! ), more people are using it than ever, and like everything else in America, it is starved of proper infrastructure funding. And then there’s Cuomo. Many New Yorkers may be confused over who’s responsible for fixing the transit system, as it’s not the city Mayor Bill deBlasio. The MTA is a state agency. Cuomo is indeed the one charged with placating his subway-going constituents, and he’s doing an outstandingly terrible job so far. “As the subway crumbles from decades of neglect, Governor Cuomo continues to point fingers instead of coming up with a credible plan to fix the MTA,” the Riders Alliance, an advocacy group for subway goers, said in a statment. The rally is scheduled for 6 p.m. in front of Cuomo’s office on Third Avenue (between 40th and 41st streets). Follow Jalopnik on Facebook live and follow me on Twitter (@allanaakh) for updates and maybe some sort of burning effigy.